116 pages. Illustrated in color throughout. Hardcover. Published on the occasion of the exhibition Georg Baselitz: Drinkers and Orange Eaters, this book is a full catalogue raisonné of the two series, which date from 1981-1982. The catalogue includes full plate images of the 27 paintings that comprise this body of work, as well as select detail images. Accompanying the reproductions is the essay “Oranges and Apples” by Katy Siegel, historical studio images, and a complete annotated catalogue of all works. These two series are regarded as some of Baselitz’s most expressive and vividly colorful works, emphasizing the physicality of paint and gestural brushstrokes. 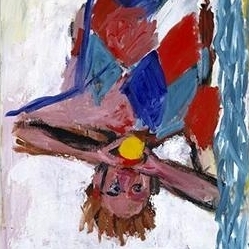 Baselitz said of this series, “I was boxing with both hands, so to speak,” using form, style and color to shatter traditional assumptions. The Drinkers and Orange Eaters represent a critical time in history and an evolving ideology of liberation.